Imagine a circus that just appears in your town one day, is only open at night, and everything is in black and white. Imagine a circus that has so many tents that you will want to come every night to try and see them all. Imagine a circus that smells of caramel and cinnamon, has a bonfire that never goes out, an ice garden, and characters with names like Poppet, Widget, Celia, and Marco. Imagine the circus is gone one morning and you don’t know if it will ever be back. I’ve never really been one for circuses, but this one is different. Why it is so different makes the story the compelling fantasy that it is. Who is really running the circus? Is it all illusion and mirrors or is there real magic involved? Is it all good or is there some kind of hidden evil involved? Two children are trained and prepared for a trial or test. What kind of trial? How does one win? What does that have to do with the circus? I loved this book. It has magic, love, and complicated characters. One that I wanted to finish to see how it would end, yet hated for it to be over. 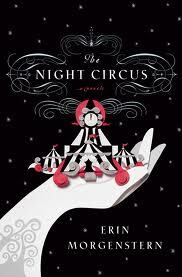 This is Erin Morgenstern’s first book and I hope she is working on another!